Skateboarding and BMX are similar – and in a sense rival – sports. Freestyle BMX involves tricks similar to street and park skateboarding. 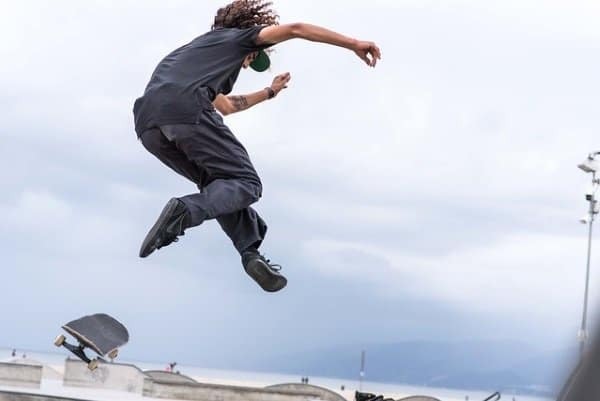 You sometimes see skaters and BMXers riding together on verts and transitions at skateparks and doing comparable tricks albeit on very different devices. If you’re new to action sports and are wondering whether you should choose a skateboard or a BMX for yourself or for your kid, this article is for you. In the next sections, I’ll go over a few fundamental aspects of these sports and compare the two on those criteria. BMX are bikes, but they’re different from mountain bikes (aka “slopestyle”) or cruiser bikes. The have smaller, stronger, and more rigid frames for severe impacts, smaller, heavily laced wheels, caliper brakes, single gear or none, and no suspension. BMX bikes cost a lot more than skateboards. You need to fork out anywhere between $200 and $700 for BMX, while a good skateboard may set you back $100-$150 – though a longboard will typically be pricier, see this post. Also, a skateboard will not cost much to maintain over time, even assuming you’ll be replacing the wheels ($50), trucks ($50), bearings ($50), or griptape. For a BMX, you may find yourself spending something like $1500 between the initial purchase price and the cost of parts over a couple of years. Custom BMX parts can be very expensive depending on brands. 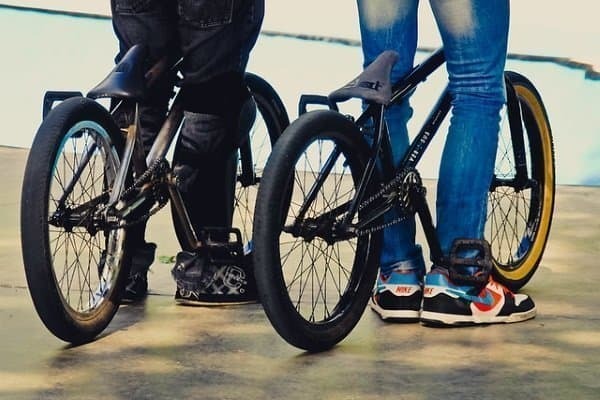 BMX bikes are very customizable – on a skateboard, you can only customize the deck, trucks, wheels, and griptape, or truck components such as hanger, kingpin, pivot cup etc. You can learn a lot when building and taking a BMX apart, but selecting and buying the parts you need can be confusing for newbies. BMX parts are not always easy to find. Skateboard parts, in contrast, are fairly cheap, available everywhere, and relatively easy to assemble assuming some basic DIY knowledge and simple skate shop tips. There’s typically much less maintenance required for a skateboard compared to a BMX. On a good skateboard, you typically only to clean or replace the bearings once in a while, replace the wheels when worn out, and change the grip tape. A skateboard doesn’t get flat tires, need chain lube or brake adjustments, or get bent wheels or (often) loose bearings. Skateboarding is fun and addictive once you start to get the hang of it and learn decent tricks. Skateboarders love jumping over big gaps and street furniture, bombing down sketchy hills, grinding rails and ledges, and/or riding skatepark verts and transitions. All these things can also be done on a BMX bike. BMX riding is often viewed as more extreme than skateboarding. You get strong adrenaline rushes from freestyle riding or racing . BMX fans feel they get a sense of freedom when riding fast down the street or getting big air on a ramp. Skateboarding is hard to learn at first. You need to find your balance, learn to stand on the moving board, learn to push and foot brake. For a newbie, there’s a learning curve even before learning your first trick. Getting on a BMX bike and moving around is easy for most people – adults or kids. However, unlike other bikes, BMX is all about tricks. There’s a lot of skills involved in performing BMX tricks, and getting started takes practice. While skateboarding requires building up your balancing skills, for a beginner BMX rider, learning the fundamental tricks takes time and has a relatively steep learning curve (and significant risk). A newbie may take weeks to learn to do a good bunnyhop, and months to do manuals and 180s, some of the most basic tricks in BMX. Learning skateboard tricks such as ollies and kickflips can be hard at first, though probably not as hard as on a BMX. While skateboard tricks involve strong balancing and coordination skills, BMX requires much more strength and fitness for performing even the simplest tricks. 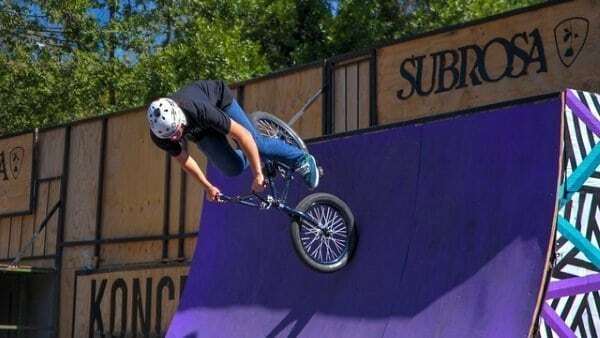 While you may see small kids doing advanced 900 tricks at the skatepark, there are much fewer young BMX riders who do really high-level tricks. Another aspect of the learning curve is the mindset. BMX newbies need a lot of self-drive to research equipment, fix hardware issue, and find places to ride. Skateboarding also requires commitment, though perhaps to a lesser degree than BMX – gear is cheaper, simpler, and readily available, and places to ride are abundant. When it comes places to ride, BMX is quite versatile. You can ride your BMX on the streets, in the backwoods, on dirt paths, and on any terrain including beat up and potholed pavement. 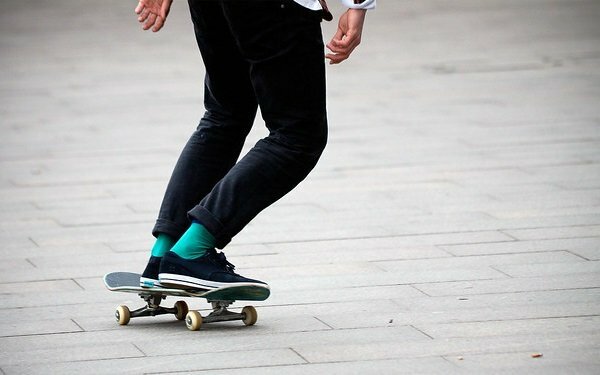 Skateboarding, on the other hand, requires reasonably smooth pavement for street riding – you can run bigger and softer wheels for more comfortable riding on rough pavement, but they will not be as good for tricks. You can’t go skateboarding in a forest like you can with a BMX. One big advantage of skateboarding over BMX is the large availability of skateparks to ride in – many of which are not open to BMX riders. Not all BMX riders have access to a BMX-friendly park nearby, dirt jumps for dirt riding, or a BMX race track. Likewise, some public city places (e.g. plazas) may be open to skateboarders but not to bikes. Thus, both skateboarding and BMX have their constraints when it comes to riding locations. Skateboarders may have more option in the city, while BMX riders can more easily go ride in the outdoors. While skateboarding and BMX both bear some amount of risk, BMX can be even more dangerous than a skateboard when getting air off a dirt jump or diving into a half-pipe. The reason is that bailing is harder on a bike than on a skateboard, plus a bike has more and bigger parts that can hurt you if you crash. When it comes to street riding, skateboarding may be riskier than BMX since it’s easier to catch a crack or bump with your wheels and fall and hurt yourself. Likewise, when riding fast down a steep hill, a skateboard is likely to get speed wobbles leading to potential crashing, while a BMX bike can bomb a hill in a smooth and stable way – and you have brakes! Overall, though, skateboarding may be viewed as safer than BMX because most of the time, skateboarders ride on plain flat ground, skating ledges and rails, or ride ramps and transitions at the park. 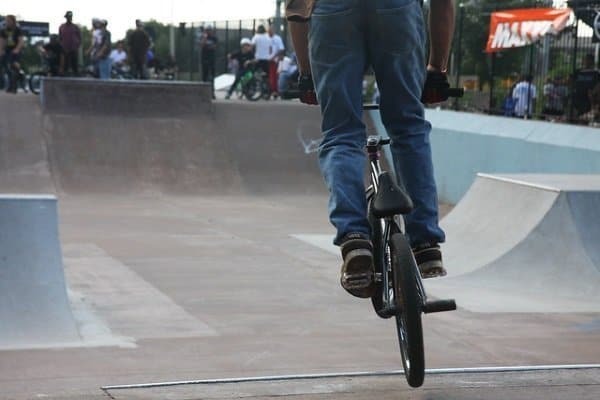 BMX riders, in contrast, tend to perform tricks involving big jumps and freestyle stunts which involve a lot more risk given the size and weight of a BMX bike. When choosing between a skateboard or a BMX, there are many aspects you need to take into account, including cost and availability of equipment, riding experience and safety, learning curve, riding locations and transportation. BMX and skateboarding have many freestyle techniques in common but otherwise differ in many ways. BMX may require an even greater commitment in terms of budget, learning effort, and risk taking.